My other sites on the Internet! UPDATE! Blair will coming out of hiding VERY VERY soon! I've been blessed to have a team of Dr's that have put me back together! So I will become the BIONIC DRAG QUEEN! Keep check this page and I'll post when I'll be making appearances very soon! On May 31, 2011 my husband Brad and I were in a major car accident. I was driving and we were hit T-Bone style. Needless to say I have had to take a medical leave of absence from any activities for we are unsure how long. I've had one surgery already and am waiting to have two more. It's nothing that I hopefully can't bounce back from. Please keep checking up on my "Where in the world is Blair? page for more information. I appreciate all the thoughtful prayers and get well wishes. They make everyday easier. 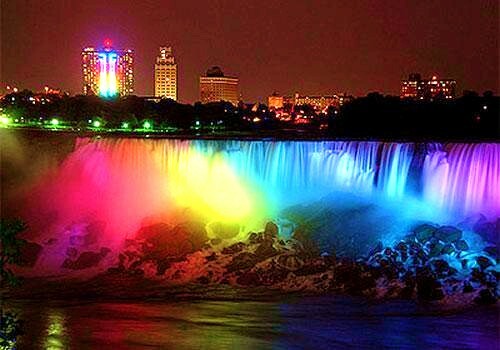 Niagara Falls goes all GAY PRIDE colored! It's just ALWAYS a beautiful time going to the falls. If you ever get the chance to visit Western New York you MUST see the falls and go to the casino! Talk about having an AMAZE BALL time!